Zachary Shapiro, a senior business administration major, chooses to attend his classes on Jewish holidays. Shapiro said he still wishes he could be with his family during the holidays. Andrew Meyer said Jewish students are a large minority group on campus and make up 10 percent of the student population at UB. But he wants his voice to be heard. “We [Jewish students] have certain needs that a regular student may not,” Meyer, president of the Jewish Student Union (JSU) and a junior business administration major, said. Instead of going to classes on holy days, most Jewish students wish to stay home in prayer, fast and relax. UB hasn’t canceled classes for Jewish holidays for the past three years, after providing those days off for 36 consecutive years. Rosh Hashanah, the Jewish New Year, and Yom Kippur, the Day of Atonement, are two of the holiest Jewish holidays. Both holidays occur during the fall semester, 10 days apart from one another, but all UB classes remain in session. UB offers excused absences for all religious observances and provides make-up assignments if students are unable to complete assigned work at any later period due to missing class. Professors are required to accommodate students who miss classes for religious observances. Meyer said he appreciates the current university policy in place but doesn’t believe it is always followed. Other SUNY schools such as Binghamton University continue to recognize these holidays and do not hold classes. Meyer said there is a lack of awareness of the university’s policy. Some students find it difficult to do well in classes and observe the holidays to their standards. He said the university does not always consider the Jewish population in scheduling important campus-wide events which conflict with multi-day Jewish holidays like Passover. Other Jewish students still attend classes so they don’t fall behind. Students and faculty who observe these holidays are unable to drive to school, type or take notes during their lectures. They may wish to spend the holiday in prayer and observation. Zachary Shapiro, a senior business administration major, said he attends classes if his professors don’t cancel them. “I would like to be able to go home if I choose to and spend the time with my family or celebrate in a way that allows me, or other Jewish students, to express their faith the way they want to,” Shapiro said. 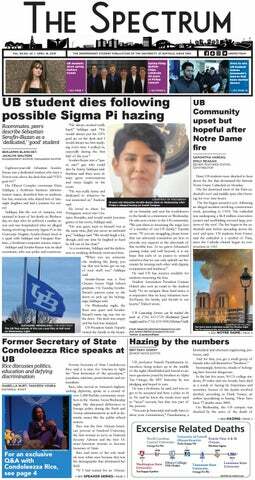 Some professors who observe the Jewish holidays and cancel classes believe UB should change its policy. Sergey Dolgopolski, associate professor of Comparative Literature and chair of the Department of Jewish Thought, believes UB should think differently about minorities when determining whether or not to cancel classes on holidays such as Rosh Hashanah and Yom Kippur. The Department of Jewish Thought sits at the forefront of the university in using this approach, according to Dolgopolski. Any student who feels that he or she is not being provided fair and reasonable accommodation is instructed to contact the office of A. Scott Weber, UB’s senior vice provost for academic affairs.